When the Union agriculture ministry announced in July, with great fanfare its decision to ban 12 pesticides and restrict 13 others, it received much kudos from nongovernmental organisations and voluntary agencies. Praise was showered on agriculture secretary M S Gill. However, enquiries by Down To Earth revealed the decision on the ban had already been taken and publicised in 1992. "The ban on the listed pesticides has already been put into effect. Somebody just chose to make a formal announcement," admitted a deputy-secretary in the ministry. Indeed, some activists continue to argue that the government policy on regulating pesticide use is extremely tardy. 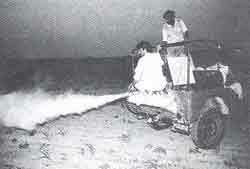 According to A T Dudani, co-author of a 1991 report, Status of Banned and Bannable Pesticides, "The government announcement is merely an eyewash -- it has been dragging its feet for years over the case of 17 proven toxic pesticides, including triazophos, sodium methane arsenate and phosphamidon." Dudani also points out that the Union agriculture ministry has yet to fix limits on the use of 50 other registered pesticides.